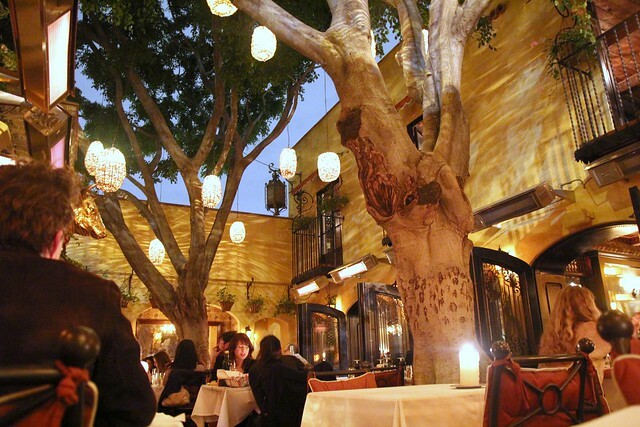 Il Covo's patio: Can you spot Lady and the Tramp splitting a spaghetti noodle? 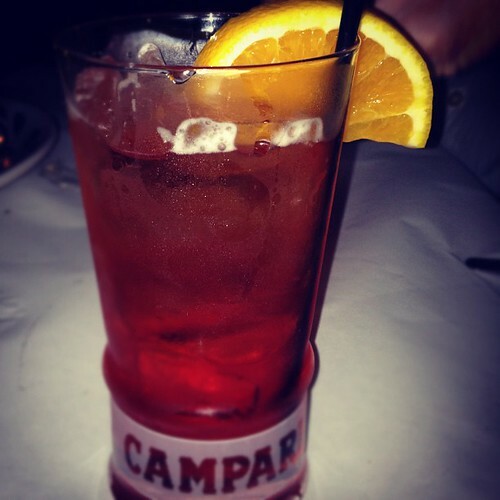 Next thing we knew we were splitting dishes of mezzelune black truffle cream ravioli and a roasted baby beets salad while giggling between sips of our Negroni and Manhattan. Tonight suddenly felt like a special occasion and I felt bad for ruining the moment by constantly taking pictures of everything…and Tweeting and Facebooking it. Heh. Fortunately, bf understands. He even held my iPhone flashlight to light my photo subjects. He’s so swell. I guess Il Covo, which means “lair” in Italian, does that to people. Being in a relationship for as long as I have been, I admit it, I forgot what it’s like to be “romanced.” Nowadays I just think it’s romantic when bf offers to make me a cocktail after a long day. But this Italian restaurant which opened earlier this year, taking the spot of Orso, is so very clearly a date night spot for couples both new and old. I swear I saw Lady and the Tramp splitting a plate of spaghetti across from us. The prices aren’t low enough for everyday dining (at least for cheapskates like me), but definitely priced for impressing dates. And the softly lit ambience, warm decor and well-paced but non-intrusive service support all this, conspiring to make that end-of-the-night kiss a sure thing. If you are on a date and want to reserve a spot on the patio, be warned that they don’t guarantee seating there. It’s that popular. But the dining room in the restaurant isn’t too shabby. There’s a cozy fireplace that I’m sure will warm many dates during the upcoming winter nights. 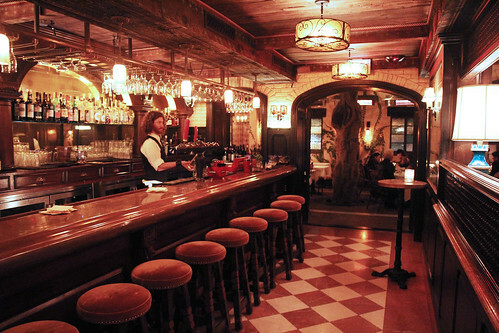 Or meet up for drinks at the bar which has velvet bar stools, a highly polished wood bar and a front row seat of the bartender making those Italian-inspired cocktails. But I’m not going to lie, the patio is pretty awesome. Cozy place to grab a drink. I think we had the best seat out there, in the far corner with our backs to the street and facing the room, looking up at the trees. We were tucked away enough to get some semblance of privacy while still feeling connected by a view of the room. There’s a tome of wines available, but I passed that up for the small selection of cocktails (half classic and half original) that Jared came up with, all using Italian ingredients. 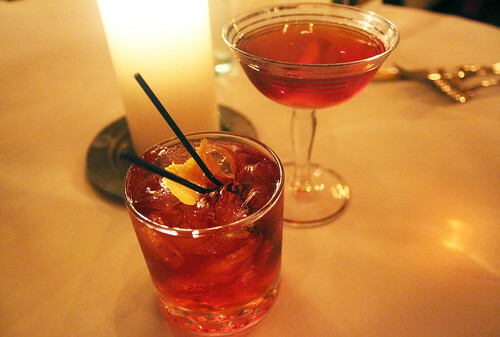 I was enticed by the Negroni (Beefeater Gin, Campari, Carpano Antica Vermouth) while bf went with the Fernet Segale, an Italian Manhattan with Rye Whiskey, Luxardo Fernet, Angostura Bitters, served up with a lemon peel. Both celebrated that bitter and sweet that Italians seem to love, and not in an off-putting way. For dinner we split a crostini, salad, couple of pasta dishes and an entree (secondi) to get a taste of everything. (Photos of everything we ate after the jump.) What’s great about Chef Roberto Maggioni’s (formerly of Locanda del Lago) menu is that even though it’s Italian it has a nice variety of rich meaty offerings and fresh veg-friendly choices. 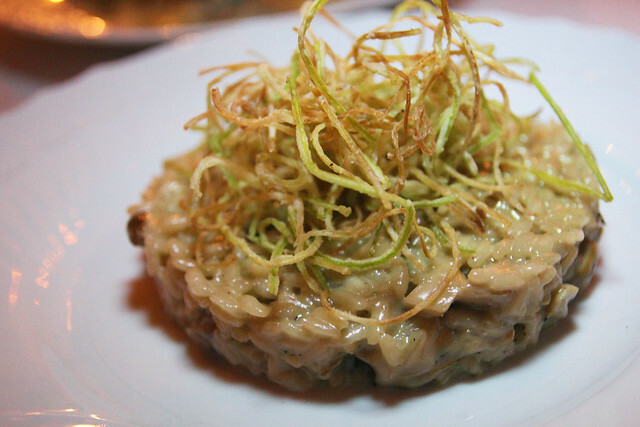 Out of everything we ordered, my favorite dish was the risotto with porcini mushrooms and toasted leeks. Although it was a bit salty, I loved that savoriness and the surprising texture of the toasted leeks. 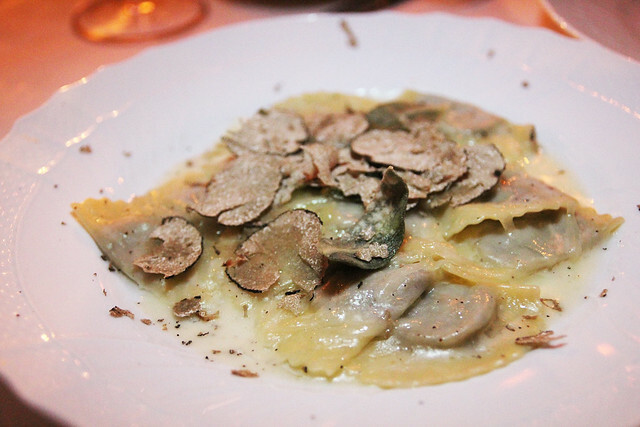 And if you love truffles, oh my god the mezzelune ravioli filled with black cream truffle. They actually grate fresh truffle on it after they deliver the dish to your table. Decadent. 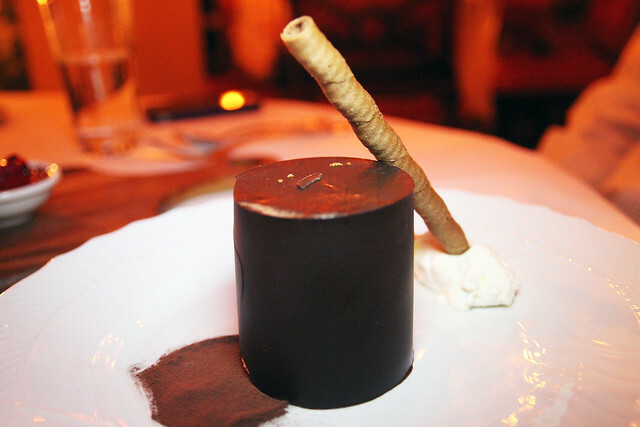 Shockingly I wasn’t all that enthused about the tiramisu, which is usually one of my favorite desserts ever. I mean, why the chocolate shell? It was difficult to break through with a spoon. And the actual cake was moist but lacked that hint of coffee and booziness that I usually love. Not that it was a horrible disappointment, just not my favorite tiramisu. 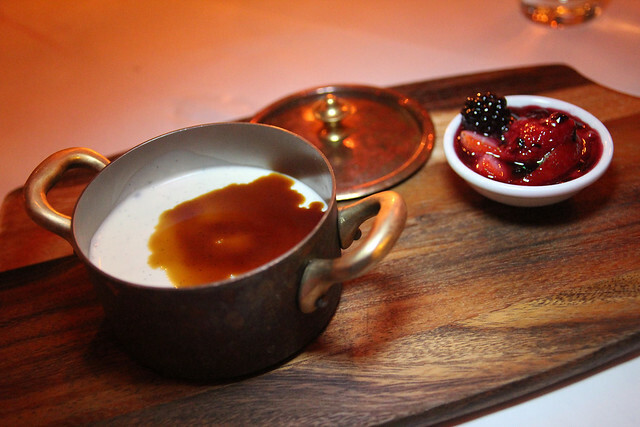 Fortunately we had ordered the panna cotta doused with a 12-year-old balsamic vinegar and served with a berry compote. The panna cotta was so creamy and vanilla-y balancing out the bit of tartness from the blackberries in the compote. 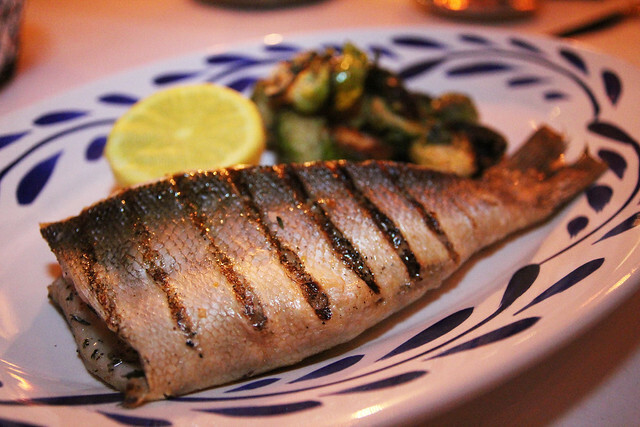 Dinner at Il Covo is an experience, not simply a place to sate a grumbling stomach. I’d love to come back but truthfully it would most likely be a special occasion again, date night or when my folks are in town. Or maybe taking a friend out for her birthday. The bar is more my speed (read: budget); sitting on the stool drinking Negronis and Americanos while indulging in some Crostini or splitting a pizza. Also, the restaurant offers a brunch with dishes ranging from affordable to snazzy. And Jared said that with regards to the brunch drink menu, he aims to build it up to offer some of the best brunch cocktails in town. I told him he has some competition in the form of Dominick’s and Eveleigh but he’s game to make it happen. If you haven’t heard about Il Covo yet, even after it’s been open since March of this year, it’s because according to Jared they wanted to open “softly” til they got their bearings. Seems that’s how these guys roll; they did it with Roger Room back in the day, asking media to keep it on the DL for about a month after the bar opened. But the night we went, you wouldn’t have guessed it’s been a virtual secret all this time. 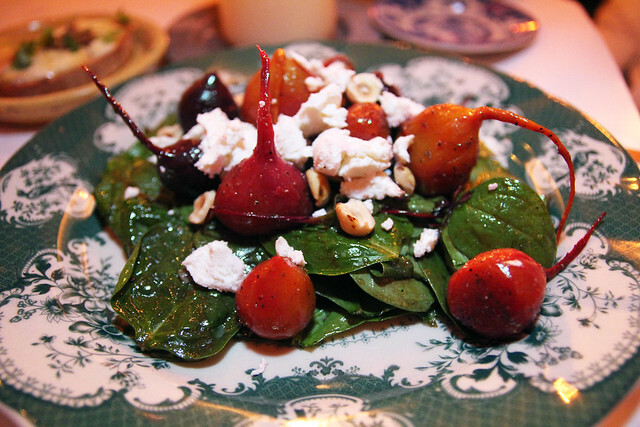 Roasted baby beets salad with spinach, hazelnuts and caprino. 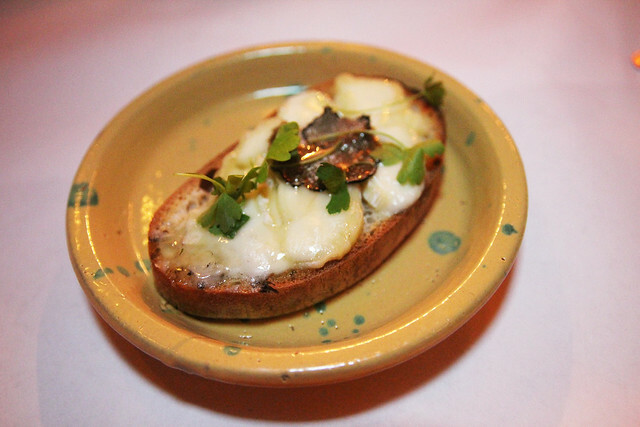 Robiola and truffle honey crostini. Wow! I love reading about places like this! 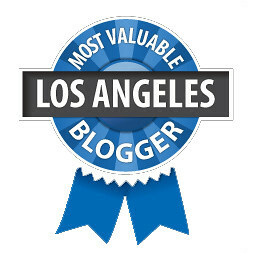 They automatically jump to the top of my “must go” restaurants in LA. This sounds like the perfect place for a romantic dinner or just a fabulous night out with the girls. The homemade ravioli looks to die for! I’ll be checking this place out for sure in the coming months. Hopefully you get to check out the patio. But then again the room with the fireplace looks nice and cozy. Let’s do it! When’s good for you? Wonderful review and thanks for the link!